East Brady Street, Butler, PA 1959. This station was owned by Triangle Gasoline Co. and was their main retail outlet. My father did some of the engineering work on the station, working with plans sent to Triangle by Kendall Refining. Prior to this building there was a small 30s "cottage" station here with separate bays that had probably been added later in life. My father dealt here for years when I was growing up. 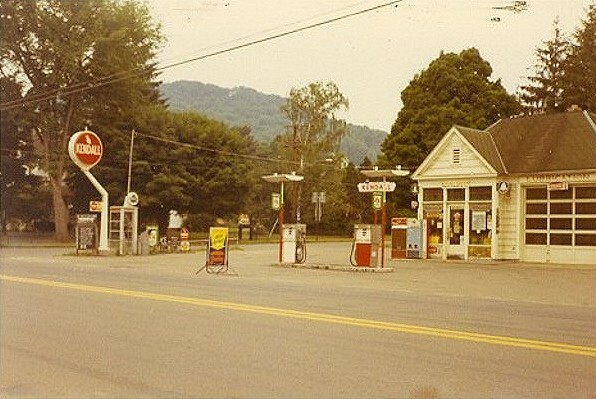 The station was changed to SUNOCO in the mid-60s shortly before I returned to Butler in 1966. The same dealer, Arnold Karnes, ran the station for many, many years and I dealt with him into the 70s when the station was finally closed. The building is still standing and was a music store for years. Not sure what is in there right now. The station was a block off of Main Street in the type of "city" location that was good 50 years ago, but long gone as a primary place to build a gas station. The long white bar station ID sign was common at KENDALL stations in the 50s and they also had one that was a big arrow pointing down to the station. Both were later replaced by a red circle plastic KENDALL logo sign with the "two finger" design seen on their motor oils. Text and photo from Walt Wimer. Custer City, PA, U.S. 219 at jct. of PA 770. July 1971. This shot shows the red circle signage that was un use in the 60s/70s until Kendall got out of gasoline marketing. Custer City is located just a few miles south of the refinery at Bradford. If you look closely, you will see the older bar sign still in use facing route 770. I don't know what this station became when Kendall went out, but in more recent years it was a BP. However, some 2-3 years ago it closed and had not reopened as of October 2004 when I was last past. I also pass the refinery each year on the way to Syracuse in October and they now have BRAD-PENN signs there. The refinery is right next to route 219 on the right heading north after downtown. 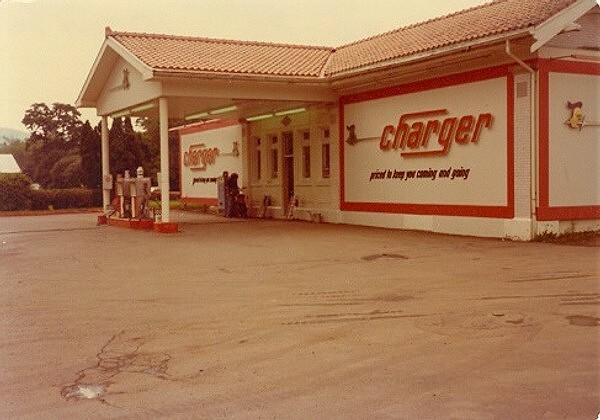 A CHARGER station located outside of Bradford on July 15, 1976. CHARGER was a very short lived Kendall discount secondary brand that wasn't around long before the company elected to get out of gasoline marketing some time in the later 70s. As you can see the station was a much older 30s style site with the lube bays blocked off. This was probably a pretty high volume KENDALL station in its day!!! Few collectors know about this brand and I know of nothing, globes, maps, matchbooks, etc. that ever showed the brand. For all I know this photo may be about all that remains of the brand. As I remember it, the only sign was a price sign, so I didn't worry about getting it in the photo. I saw a couple others around Bradford that day, but that was the first time and last time I ever saw the brand!! Kendall Refining Co. was formed as a refiner of lubricants in 1881 and entered the gasoline market in 1922. 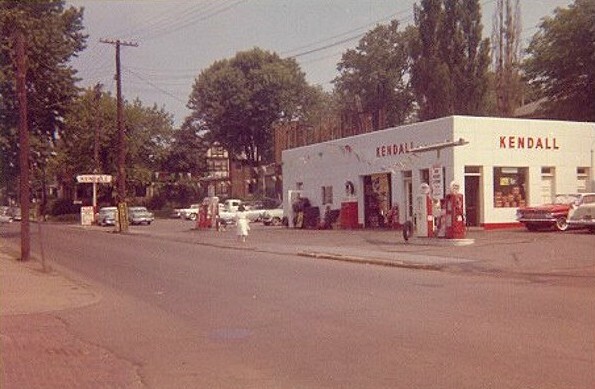 They were a major factor in the western PA and NY markets until the gas shortages of the mid-70s and according to Wayne Henderson, the last KENDALL gas station closed in 1976. Along the way Kendall became part of Witco Chemical Company, then in 1996 both the KENDALL and Witco's AMALIE brands were sold to Sun Oil Co. More recently the KENDALL brand was sold off to Phillips. It doesn't seem I see much of KENDALL anymore and I have the feeling the brand is on a downhill slide!! Going back to gasoline, it always appeared to me that there were more KENDALL stations up in New York than in western PA, but I never had figures to back that up. According to late 50s NPN listings, Kendall had some 800 sites, which was more than Quaker State, but probably less than Pennzoil, which never gave their figures to the NPN. At that time all three companies had a ton of small "mom & pop" garages, stores and stations in the rural & small town areas of western PA and border states. But all three had some good stations that matched the majors, and as I mentioned before, they matched the majors on price, rather than discount their gas like most Western and Midwestern Independent Refiners did. For you map collectors, KENDALL maps go back at least as far back as 1926 and were issued into the 70s. The former Kendall refinery is still in operation at Bradford and is owned by American Refining Group, which makes BRAD-PENN motor oil. Information sent by Walt Wimer.